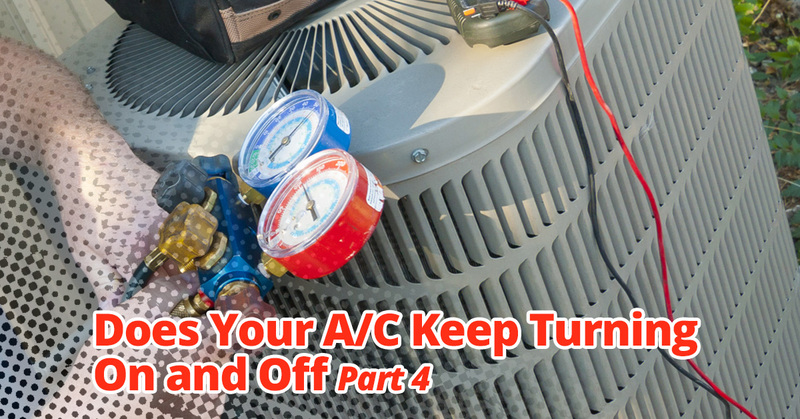 As you know, it’s normal for an air conditioner to cycle on and off – that’s the main way it saves you money. However, if your air conditioner starts cycling more rapidly than normal, it’s trying to tell you something is up. Because there are so many possibilities, we recommend you call us to come out and see what’s going on. In our last three blogs, we’ve looked at how thermostat placement and dirty air filters can make air conditioners cycle too quickly. Today, we have another possible reason for the issue. When a unit gets low on refrigerant, it acts a lot like it does when it has a dirty air filter. The coils freeze, which prompts the unit to turn off and then back on. If we assess your unit and discover low refrigerant is the culprit, we won’t just top off your refrigerant. The only way your refrigerant goes down dramatically is when there’s a leak in the system. Adding refrigerant will simply perpetuate the problem. Instead, we will find the leak, repair it, and then add refrigerant. All of our technicians are licensed to handle this volatile material, and will do so with the utmost safety and consideration of your property. At Tippetts Mechanical, we have extensive experience with air conditioners! Las Vegas depends on them to make the summers bearable, and they are the hardest-working machines in the whole city. Contact us for expert HVAC repair in Las Vegas, especially air conditioning maintenance and replacement!